Do I have to limit the colors of the baby booties to black/white/gray? Please do. This is called TheMourningProject.com. The Project is about uniting to mourn and right a tragic wrong; my instinct tells me bright or pastel colors just don’t connote that. That said, if you have some beautiful black yarn or fabric with a tiny red thread or dot (for instance), and it ‘reads’ black, feel free to include that in the Project. Use a variegated white-gray-black yarn or fabric if you like. Your artistic contribution will incorporate these colors in a unique combination with a pattern and fiber of your choice. Embellish to your heart’s content. Just be sure to mail all baby booties to Mary Vaneecke, 2000 South Hermosa, Tucson, AZ 85713 by Mothers Day, May 12, 2019. UPDATE: If you want your contribution to be part of the first exhibition in Tucson, AZ, I need your booties by March 15, 2019. Can I make a pair of booties in memory or honor of someone? Yes! Make a note on the donation form and write it in permanent fabric marker on a white ribbon, strip of fabric, interfacing, Tyvek, or other durable paper or fabric. Stitch the ribbon or strip together with your pair of baby booties. This donation checklist has a diagram. Please mail all baby booties to Mary Vaneecke, 2000 South Hermosa, Tucson, AZ 85713 by Mothers Day, May 12, 2019. UPDATE: If you want your contribution to be part of the first exhibition in Tucson, AZ, I need your booties by March 15, 2019. 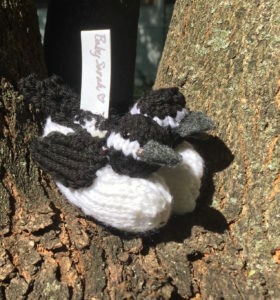 Little Chickadees, in memory of baby Sarah, by Nanci Elf. I don’t know how to sew, knit, or crochet. Do I have to hand-make the baby booties? My vision for TheMourningProject.com is that each of the 23,000 babies lost annually will be remembered by a unique, handmade, heartfelt little ‘elegy.’ If you do not sew, knit, felt, or crochet, consider asking a crafty friend to help. Sewing a simple pair of booties can be done in about a half hour (links to some free patterns here). Your gift does NOT have to be technically perfect or lavish, though you are welcome to make it as fancy as you like. What matters is you care enough to make this little elegy. 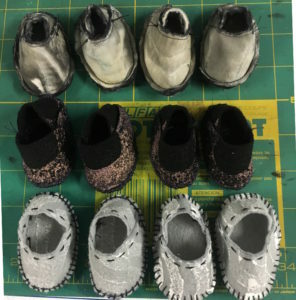 As an alternative, you could purchase a black/gray/white pair of infant booties and embellish them yourself with contrasting white, gray, or black marker, paint, sequins, lace, etc. And of course, advocacy is a critical part of this project. You don’t have to be creative or crafty to write a letter or contact an elected official, arrange an exhibition, or make another donation to the project. Please don’t wait! 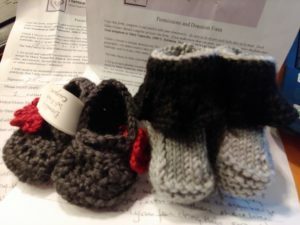 Mail all baby booties to Mary Vaneecke, 2000 South Hermosa, Tucson, AZ 85713 by Mothers Day, May 12, 2019 at the latest. UPDATE: If you want your contribution to be part of the first exhibition in Tucson, AZ, I need your booties by March 15, 2019. Can I make a pair of baby booties anonymously? Yes. Just note that on the donation form. Link here to the form. Do you know where I can get a nice free pattern? There are loads of free patterns online. Click here for links to some of my favorites. Gansie booties by Kathie Popadin. All her patterns are free for use on this project. Just message her at shakeyourbooties on Ravely. Does this project have anything to do with abortion? No. Infant mortality concerns wanted children who are born alive and die before their first birthday. Whatever side of the abortion issue you are on, you are welcome to support TheMourningProject.com. My hope is that whatever our respective political leanings are, we can all be United Against Infant Mortality. Does it cost anything to be a part of TheMourningProject.com? There is no application fee. I am asking each maker to consider contributing $1 for each pair of baby booties made. While I take no salary as founder of the Project, I expect to incur costs related to shipping, storing, and exhibiting the installation. The rolling, lockable shipping crates curators recommend for shipping the work will cost thousands of dollars. Click here for a sample. Can I participate even if I live outside the U.S.? Of course. The project focuses on the US infant mortality rate, but all are welcome to contribute handmade booties. What are you doing with the money you collect? I will donate all the time I spend on the Project. I do expect to incur significant costs related to the ultimate art installation, website design, storage, postage, appropriate shipping containers, insurance, travel and other costs related to TheMourningProject.com. I am seeking grant funding, and possible sponsorships to cover these costs. Right now, I am requesting that baby bootie makers consider making a donation of $1 for each pair of booties they make. This will allow me to take advantage of exhibition opportunities as soon as they present themselves, and plan ahead as much as possible. Any monies left over at the end of the project will be donated to the March of Dimes. 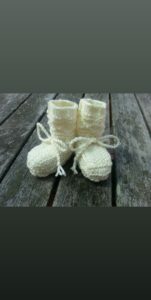 Once the baby booties start coming in, I will be able to put together a budget for the project and will post it on this site along with information on funds collected. First two submissions-by-mail to TheMourningProject.com! When do you need these baby booties? Don’t wait until the last minute to send your contribution. If you are making many pairs of baby booties, thank you! Send them in batches if you can. Please mail all baby booties to Mary Vaneecke, 2000 South Hermosa, Tucson, AZ 85713 by Mothers Day, May 12, 2019. UPDATE: If you want your contribution to be part of the first exhibition in Tucson, AZ, I need your booties by March 15, 2019. I realized that if everyone waits until Mother’s Day to send their booties, I could go from 100 booties to 50,000 in a week. If you send in your contributions as you make them, I can prove to venues that the exhibition is a go sooner rather than later. I can also get the word out if we reach the goal well before Mother’s Day and end the call for baby booties. There is the tantalizing possibility of an exhibition of The Mourning Project on Mother’s Day, 2019 in Washington D.C. ( I can’t say more than that right now.) If it materializes, I would want as many booties as I can get before then when they are shipped from Tucson. What are you going to do with 23,000 baby booties? I will create an art installation to draw attention to the problem of infant mortality in America and advocate for policy changes that can save babies’ lives. What will the final art installation look like? Good question. I am working on that. The full installation will be large. I won’t be able to estimate how large until I have collected a thousand or so booties. For that reason, each exhibition will probably vary by venue as space allows. The work will have to be durable enough to travel and economical enough to ship and reconstruct. These are just a few of the things I need to take into consideration, but each installation will be respectful and in keeping with the spirit of the Project. Please mail your baby booties to Mary Vaneecke, 2000 South Hermosa, Tucson, AZ 85713 no later than Mothers Day, May 12, 2019. UPDATE: If you want your contribution to be part of the first exhibition in Tucson, AZ, I need your booties by March 15, 2019. Where will this art installation appear? The first exhibition will be in my hometown, Tucson, Arizona, from April 2-5, 2019. Once I have an idea of the size of the entire installation, I will submit proposals to venues across the U.S. Do you have a suggestion for an exhibition venue? Contact me at mary@maryvaneecke.com. Follow this website, my blog, Facebook page, Twitter account, etc. to find out where the exhibition will appear. Booties can be knit, sewn, or crocheted. What will you do with all those baby booties when the Project is over? That’s another good question. I expect the exhibition schedule will cover 2-3 years. Some of these baby booties–particularly those made in memory of someone–may find their way to elected officials as part of an advocacy campaign. Some will be donated to charities serving infants and children. It’s possible some portion of the Project may become part of a museum collection. Whatever happens, final disposition of the baby booties will be in keeping with the spirit of the Project. Do you know of a charity or museum that would be interested in receiving these items? Have another idea about how they will ultimately be used? Contact me at mary@maryvaneecke.com. My felting study group will make booties on Thursday, Oct. 18. so I am studying your website so I can answer any questions that might come up. I see you are asking that they are sent to you by May 19, 2019, but your first installation is scheduled for April 2019. Could you clarify? Thanks for this, Kathryn! Be sure the booties are in the colors of mourning–black, white, and gray. I am asking for people to send their booties as they are made. This way I know (and the exhibition venues know) that there will be booties to display. It also avoids the possibility that I get 40,000 baby booties all at once. If I get the goal of 23,000 ahead of time, that is great, I will let the fiber art community know. The first exhibition will be in Tucson, AZ, and I am planning for April to give people an incentive to send their booties early. It also leaves open the possibility for a Mothers Day 2019 exhibition in Washington D.C. (unconfirmed at this point). Thank you for asking! I am happy to be a new member of Ravelry and the Needlework on the Net group! Thanks for inviting me. If there is another group I should belong to, please let me know.